SolarCity took a major step today in an initiative that could double the number of residential solar photovoltaic installations in the United States. U.S. Energy Secretary Steven Chu today announced the offer of a conditional commitment for a partial guarantee of a $344 million loan to help secure financing for SolarCity’s “SolarStrong™” project. As part of the project, SolarCity plans to partner with the country’s leading military housing-privatization developers to install, own and operate up to 160,000 rooftop solar installations on as many as 124 military housing developments across 33 U.S. states. The project is expected to create more than $1 billion in solar projects and 371 megawatts of new solar generation capacity. USRG Renewable Finance, a subsidiary of U.S. Renewables Group, will serve as the lead lender for the project in partnership with BofA Merrill Lynch. SolarCity, which currently employs more than 1,200 people in 11 states, will create new jobs and help jumpstart the renewable energy industry in up to 22 additional states, some of which have very little solar generation capacity today. According to the National Renewable Energy Laboratories’ (NREL) Jobs and Economic Development Impact model, the SolarStrong installations would be expected to create nearly 6,000 direct job-years related to the installation and ongoing maintenance of the systems. 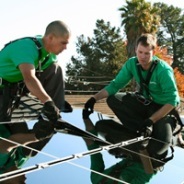 SolarCity hopes to fill as many of the jobs as possible with U.S. veterans and military family members. The SolarStrong projects will likely include installing solar on other privatized buildings on military bases, such as community centers, administrative offices, maintenance buildings and storage warehouses. The first SolarStrong-eligible project—a coordinated effort between real estate developer Lend Lease and SolarCity—is already underway at Hickam Communities at Joint Base Pearl Harbor-Hickam in Hawaii. When completed, that project alone will provide renewable power to more than 2,000 military family homes. The SolarStrong project will help the Department of Defense (DOD), the single-largest energy consumer in the U.S., secure its energy needs from renewable sources operated in parallel with the utility grid. DOD has a stated goal to migrate to greater than 25 percent renewable energy generation by the year 2025.